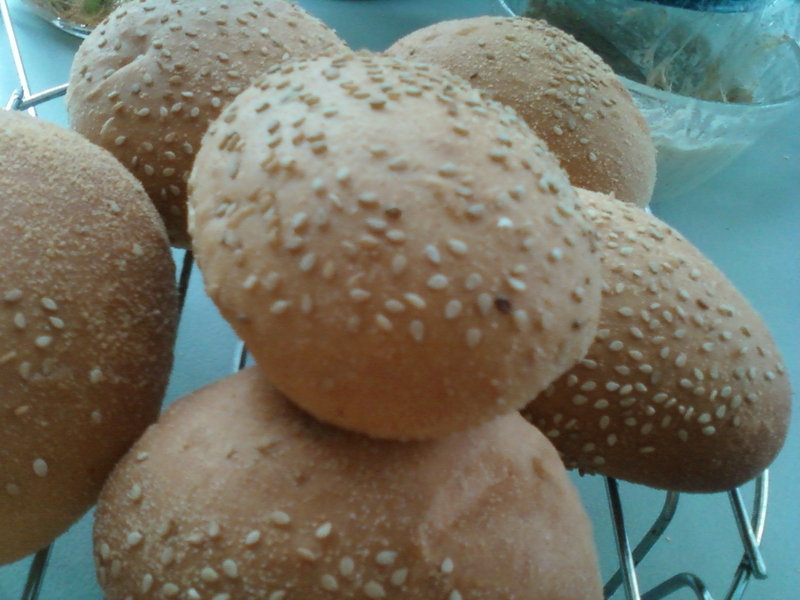 The only good reason to use the phrase "buttering up" is with these hot fresh off the oven Sesame Seed Pandesal. 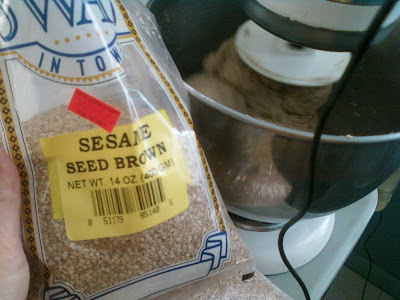 So i decided to use this brown sesame seeds i bought in Patel's in East Brunswick, New Jersey. 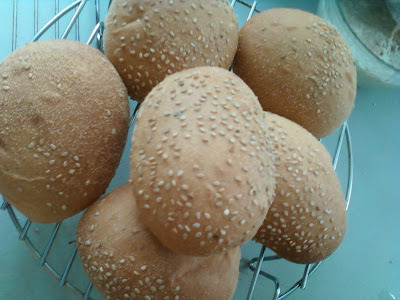 It is unlike your regular sesame seeds, these are plump, larger and of course brown. So why not a Pandesal with a Sesame Seed topping? 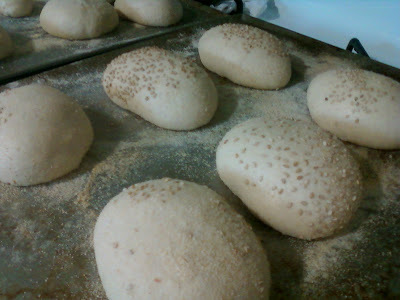 Hmmm, to do it, i have to spray the top of the rounded or shaped dough with water, then dunk it on a plate of sesame seeds, adding a dredging of the traditional breadcrumbs alongside. Not bad. First off i have to make a sponge, if you are at the mercy of the flour we have here, with my formula, you have to make a sponge. 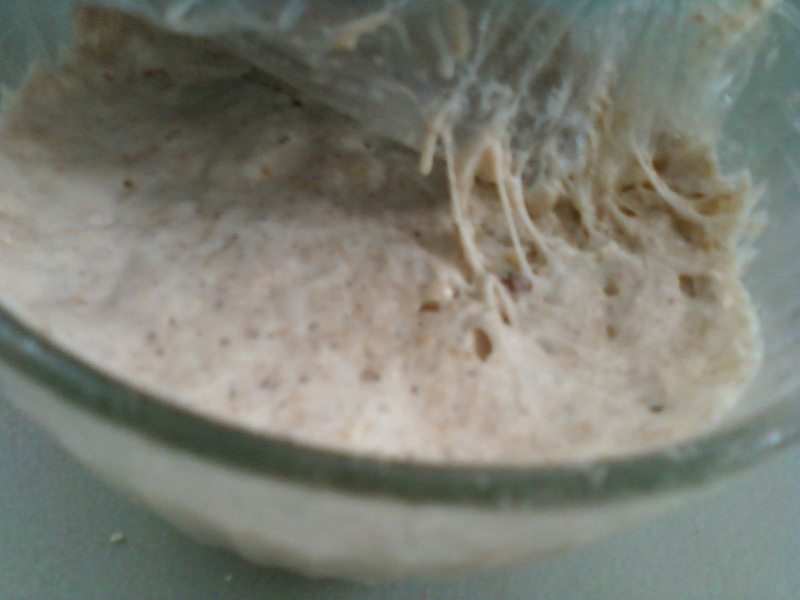 I fermented this overnight, about 12 hours. Because it is made with whole grain, about 3%, this sponge will ferment fast so i kept it inside our pantry which gets really cold especially at night. I made this around late April, and it was still very cold in our house, around 63-64 with the heater on. Pantry can get to 60 F sometimes. Cool? Yes and Nah ah, not when you bake and covered with 2-3 layers of clothes, constantly tugging the sleeves left and right. Bummer. 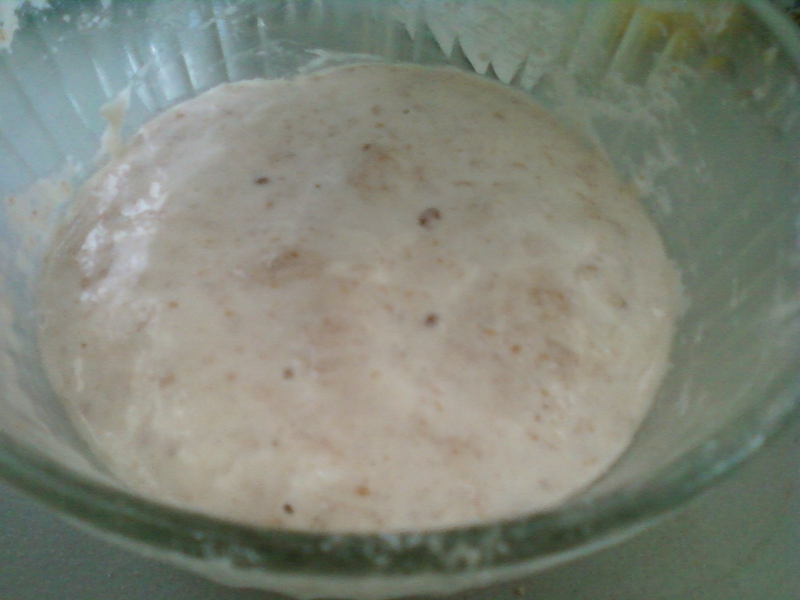 The large Pandesal proofing, i made a small batch of 75 grams each because i intend to make a burger bun out of it. Although it did not materialize because my nephew John used the buns to make his Pandesal Pizzas, i am glad he liked it. Here's the lovely golden brown Brown Sesame Seed Pandesal. You can get the basic Pandesal Recipe in my website, just click the Pandesal link. It is a No Time Dough recipe, but if you have the stronger 13-14% bread flour, no need to worry, you can still get a high yielding roll such as the one featured in this blog. Incidentally, been losing sleep lately because of this incident happening in our place. It has been 3 weeks in a row where this teenage boy have been shouting "F...You"! to us, right in front of our house while he was in a car passing by with his friends probably from school. The first incident happened while my nephew was almost inside the house. I heard it and so did my sister who was visiting from Manhattan. The second time, one week later on a Friday, i was alone and i heard him scream a loud, "gigil na gigil", forced, angry "F Youuuuu"! Loud and clear. I ran outside to see at least what the make of the car was but i only saw a silver car, no plate number. Third time was last Monday. This is getting to be disturbing and hurtful. My sister, was waiting for Marc to arrive, usually at around 2:21 pm. I forgot to open the door like the first time, so while we were meeting Marc near the doorway, and as i turned my back to check on the oven, the "F You" happened again. This time my sister was able to see the occupants of the car, the same boy with the curly hair who screamed at me way back last summer while i was on my way home from the corner Deli, the same boy who threw a block of snow to Marc way back January. He did not curse at me back then, just a loud, intimidating, shouting and menacing "HELLLLLOOOOOO", and then he looked at me. Heart pounding, i almost fell to the road. I got scared because i thought he would hurt me. Last Saturday, while i was in my baking area, 2 feet away from the front door, someone made this loud banging on the door. BANG,BANG,BANG!, three loud, rapid thuds. I froze. I did not open it because i admit, i got scared. I mean, who would bang your door in broad daylight? After maybe 4-6 seconds of standing there frozen and nervous, i lifted the blinds, and did not see anyone. He could have jumped the stairs,and ran to the right side down the road. I mean, i did not really open to look who was on the street so it was a mistake thinking about it later. I could have called one of the boys to see who was running away down the street right? At least we have an idea of what he looks like. Could he be the same boy who was cursing at us? At 10 am in the morning? Why would you risk going up the stairs, to the front porch, bang on our door on a Saturday. You know everyone is at home on a weekend. It's not like it was 10 pm in the evening where the streets could be dark sometimes. Is this the last of it? What else can this person do? Ang tapang mo naman to dare do something like this because our house is in the open, there is only one way out and that is the long stretch of road where we can see you and probably chase you if you do something bad. If only i opened the door and went out. Once is annoying and weird. Twice, it is disturbing. Three times, it is already getting to my nerves. I think they are not only harassing my nephew, they make it a point to curse at Marc while he enters our house so it is directed towards us too. I wonder what kind of parents this boy has. He sits at the back right side, with 3 other young boys who tolerate what he does and probably enjoy it. Is this the reason why nobody stays in this house longer than 2 years beside us? The last occupant of this house stayed only for 6 months. I hope what the oil guy said to my sister is not true. 3 years ago, when my sister was having her furnace checked down in the basement, this guy asked her if she was Mexican. My sister asked why and she was shocked when he told her that "we are driving Mexicans away", of course only after my sister said no, we are Filipinos. Our surname is Villafranca so he probably thought we were Hispanic. Hmm. Marc definitely could pass up as a Hispanic because unlike me and my siblings, my mother too, has light brown skin. He looks darker when you sit him beside us. Not as pale white as me and my siblings. Marc also has beautiful eyes, not typical of Asian tsinita, chinky eyes but really Meztizo eyes with long eyelashes so it could be that they think Marc is Hispanic and maybe Arabic?. Maybe. God forbid but i thought racial discrimination will never touch our front door steps. I hope not. I have been here for almost 15 months and i have not heard a single "f you" directed towards this house. Only now. Maybe we should put up Pacquiao's poster. Or ask Marc to wear one of his shirts. John said he saw a Pinoy boy wearing Pacquiao's shoes in school last week. Why didn't i buy one? I cannot really be mad at them knowing these are boys the same age as my nephews. I pity them, they probably have hatred and anger issues and Marc was the perfect target and outlet. Little do they know that they are also corrupting themselves by bullying Marc and us. Quite frankly, there is nothing else we can do but be vigilant. I am setting up my video cam every 2:15 pm from now on, 7 minutes before Marc opens the door. Good thing i work at home. This boy will never say a word. Had i not told him the car was silver, he will never tell me. He was not telling us anything, but i think he knows what these boys look like, he said he thinks he saw them in school one time but never said anymore after that. I wonder if these boys are in his class? What if they do the same thing to Marc at school? Marc, hang in there. I know you cannot read this, but my prayers for you. Hope you pass the basketball try out.